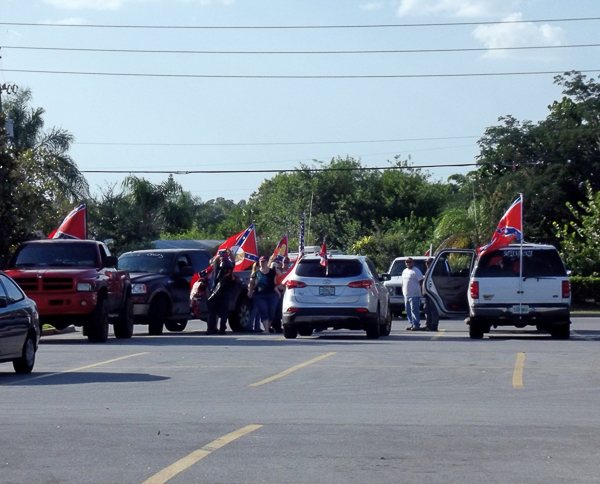 In the deep south, well a town an hours drive south of Orlando, Florida, USofA, I spotted a caravan of mainly pickup trucks and SUVs. These weren’t your normal Sunday joy ride vehicles. What drew my attention was the stars and strips; Not of ole’ glory, the United States of America flag, but the flag of the almost forgotten Confederate States of America. 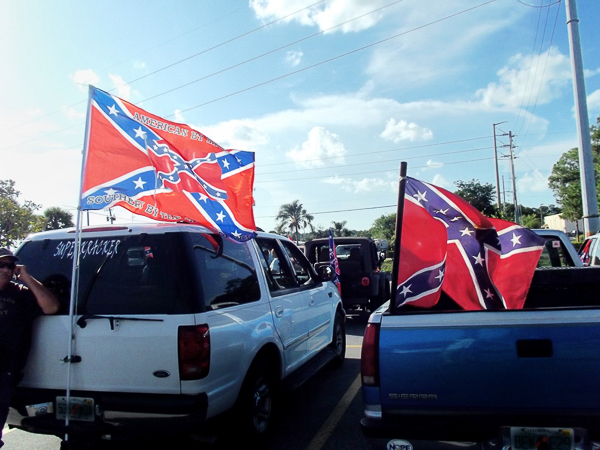 Currently, the Confederate flag is receiving scrutiny from the media, being portrayed as a representation of racism, mainly toward black Americans. 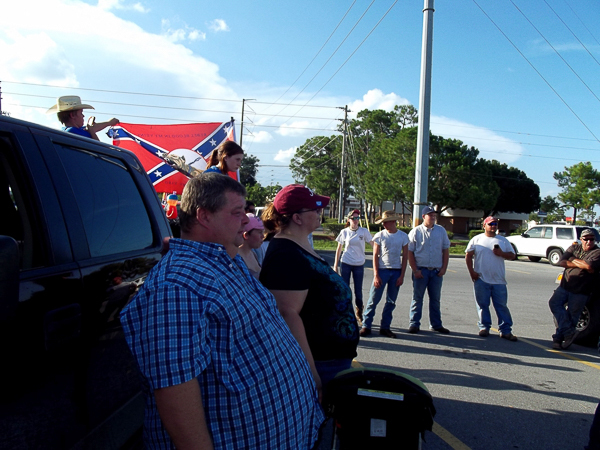 According to these proud Confederate flag waving American citizens, they view the flag as heritage not hate. These are pleasant folk, all American types – Patriots. When I approached them they declared no ill will or racism in their hearts. 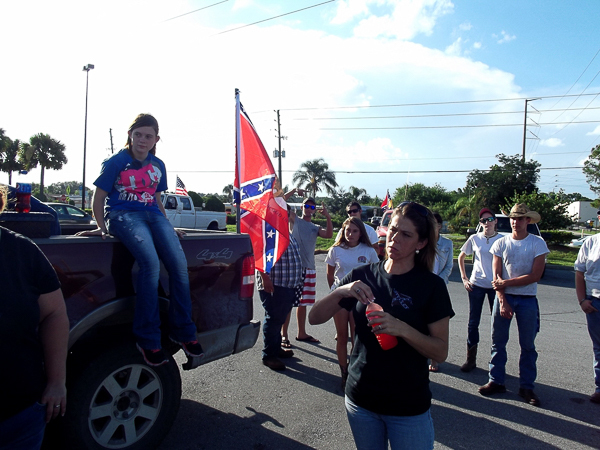 One of them in the group even expressed sadness as she spoke to me about loosing two of her family members in the civil war fighting for the confederacy. As one of the flag bearers told me and as his flag proclaims. He seemed to be the leader of the group. Carrying his child, he walked over to his vehicle and proudly displayed his flag. Battles fought for state independence and state rights. In the American Civil War, over 440,000 men of all colors, religions, nationalities fought bravely and died for the Confederate Army. They died for what they believed in, mainly country and family. 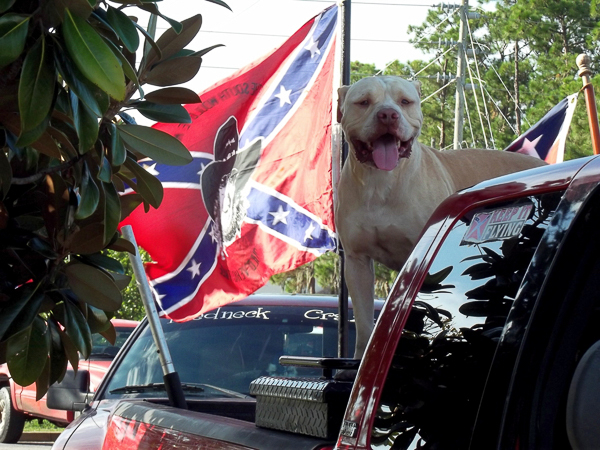 One can look at the Confederate flag and it may be perceived as a racist flag, as a minority use the flag as a symbol of hate; however, there are a group of Americans who look upon it as a symbol of sacrifice, pride, heritage and honour. Whatever efforts are made to lower the flag, one cannot erase it from the United States of America’s heritage or memory.